The researchers achieved this feat by the use of scanning tunneling microscope. 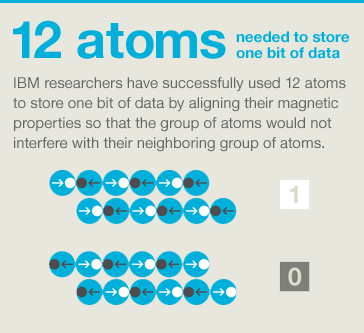 In the process a bit of image was stored in 12 atoms. At present it took about a million atoms to store a bit on a modern hard disk. According to IBM this is the world’s smallest magnetic memory bit. This can bring a new revolution in the field of making the denser forms of magnetic strip and computer memory for hard disks and solid state memory chips. The research also found that below 12 atoms the bit used to lost information. A bit can have a value of 0 or 1 and is the most basic form of information in computation. The magnetic fields of bits developed from traditional ferromagnetic materials can make an impact over neighboring bits if they are placed too densely with each other. However, the process from the lab to production would take some time. Nice researched information for Web Copywriters to place the information perfectly. Thanks for sharing.